For a while now, I’ve been sitting on a little morsel of news, because I’m exceedingly paranoid about the evil eye (embarrassing, but true): I’ve signed a contract with Menucha Publishers for the novelization of Glixman in a Fix, my serial from Binah BeTween. This morning, I received the list of changes the editor would like to see in the novelization. The list is totally reasonable, and mostly consists of changes I suggested in the first place, mostly fixing loose ends I dropped and introducing an idea earlier in the text so that it’s less surprising when it pops up near the end. For some reason, I feel short of breath and ill to the stomach, like I’m about 5 minutes away from a panic attack. I’m not sure if it’s excitement or fear of failure triggering my parasympathetic nervous system. I’m pretty sure I’m experiencing both. Exciting news! One book ready for orders, the other nearly ready! When my husband checked the mail after Rosh Hashanah had ended, he found a couple packages for me in our mailbox from Createspace. In one, we found the proof of the anthology that I’ve been working on, Sliding Doors and other stories, and the other package contained the proof of Mazal’s Luck Runs Out. I’ve been spending the last couple days proofreading those books. In Sliding Doors, the font size suggested by the template was so small, I was afraid no one would be able to read it. I went back and increase it. I also had do a lot of clean-up on the italics. The stories in the collection were from different magazines, with different policies about how to handle foreign words. With so many Hebrew and Yiddish terms throughout the text, punctuating these terms consistently was a big job, and I didn’t catch them all before uploading files to Createspace. Mazal had some similar issues, but I also discovered that I didn’t like the cover I’d designed. I spent a lot of time tinkering with it to get it right. Here’s the link to Mazal’s Luck Runs Out! It’s available already in paperback via Createspace and Amazon. If you order it now, you should receive it by Sukkos! And if you buy it…please post a review on Amazon! And tell other prospective readers if you like it! The target audience is Jewish kids 8-11, the kids who like the stories in Mishpacha Junior, Binah Bunch, and so on. The main character of this novella is Mazal, a Persian girl living in Los Angeles. The average Orthodox girl will identify with her misadventures, but it was especially important to me to represent a strong Persian Jewish character, something rarely seen in kids’ fiction. I hope to have news about the other book soon. 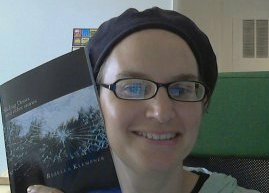 Here’s me, with the proof of Sliding Doors and other stories. It’s not quite ready yet for ordering. Oh, all right, I’ll spill the beans. I’ve compiled several of the stories I have published previously in international Jewish kids’ magazines into an anthology, selecting the ones that got the most fan mail, and which teachers have mentioned they’d like to use in their classrooms. I’m self-publishing it, IY”H. Target audience: readers age 10-16. We’re just waiting on the proofs – which I’ll have to proofread – before they will be up for sale. Also on the self-publishing front, many years ago, I had a number of stories starring two characters, Esti and Bluma, which ran in a local-to-L.A. Jewish magazine. Those stories got lots of fan mail here in L.A., so I started to shop around for a publisher. I had a couple near-misses, where a publisher said they were very interested, but then backed out pretty late in the game. After that, I added some more material, changed some things around to make it more like a middle-grade novel, as opposed to a short story collection, and tried yet another publisher. As they say in Yiddish: gornisht. My husband, though, really believed in the book, and my beta testers – kids from around the neighborhood – enjoyed it thoroughly. Doing Maker Camp over the summer really inspired me, as well as this post on Positive Writer, so after working on the anthology, I pulled out this older manuscript and started editing that one. Ready for me to reveal more embarrassing truths? At the time a friend first accused me of being a reverse snob, I had no idea that such a label existed. It turns out that not only does it exist (there are definitions for it both on Dictionary.com and in the Urban Dictionary) but I indeed was one. At first I was proud of being a reverse snob…until I did some soul-searching. The good news is that I’m now in recovery. Has anyone ever accused you of something that initially you were proud of, but later reconsidered? Please share your story in the comments below! And don’t forget to check out my essay on Tablet. Last chance to get a new, unpublished story from me! Publishing news: I have a Rosh Hashanah-themed story in this week’s Binyan, and, G-d willing, I’ll have another one in Binah BeTween next week. But would you like an exclusive, unpublished story to share with your kids this Rosh Hashanah?